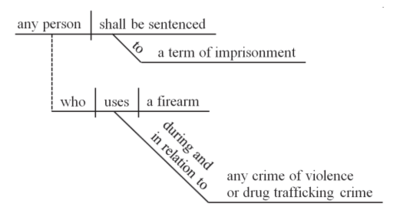 (c) (1) (A) Except to the extent that a greater minimum sentence is otherwise provided by this subsection or by any other provision of law, any person who, during and in relation to any crime of violence or drug trafficking crime (including a crime of violence or drug trafficking crime that provides for an enhanced punishment if committed by the use of a deadly or dangerous weapon or device) for which the person may be prosecuted in a court of the United States, uses or carries a firearm, or who, in furtherance of any such crime, possesses a firearm, shall, in addition to the punishment provided for such crime of violence or drug trafficking crime— (i) be sentenced to a term of imprisonment of not less than 5 years; (ii) if the firearm is brandished, be sentenced to a term of imprisonment of not less than 7 years; and (iii) if the firearm is discharged, be sentenced to a term of imprisonment of not less than 10 years. (B) If the firearm possessed by a person convicted of a violation of this subsection— (i) is a short-barreled rifle, short-barreled shotgun, or semiautomatic assault weapon, the person shall be sentenced to a term of imprisonment of not less than 10 years; or (ii) is a machinegun or a destructive device, or is equipped with a firearm silencer or firearm muffler, the person shall be sentenced to a term of imprisonment of not less than 30 years. (C) In the case of a second or subsequent conviction under this subsection, the person shall— (i) be sentenced to a term of imprisonment of not less than 25 years; and (ii) if the firearm involved is a machinegun or a destructive device, or is equipped with a firearm silencer or firearm muffler, be sentenced to imprisonment for life. (D) Notwithstanding any other provision of law— (i) a court shall not place on probation any person convicted of a violation of this subsection; and (ii) no term of imprisonment imposed on a person under this subsection shall run concurrently with any other term of imprisonment imposed on the person, including any term of imprisonment imposed for the crime of violence or drug trafficking crime during which the firearm was used, carried, or possessed. (2) For purposes of this subsection, the term “drug trafficking crime” means any felony punishable under the Controlled Substances Act (21 U.S.C. 801 et seq. ), the Controlled Substances Import and Export Act (21 U.S.C. 951 et seq. ), or chapter 705 of title 46. (3) For purposes of this subsection the term “crime of violence” means an offense that is a felony and— (A) has as an element the use, attempted use, or threatened use of physical force against the person or property of another, or (B) that by its nature, involves a substantial risk that physical force against the person or property of another may be used in the course of committing the offense. (4) For purposes of this subsection, the term “brandish” means, with respect to a firearm, to display all or part of the firearm, or otherwise make the presence of the firearm known to another person, in order to intimidate that person, regardless of whether the firearm is directly visible to that person. (5) Except to the extent that a greater minimum sentence is otherwise provided under this subsection, or by any other provision of law, any person who, during and in relation to any crime of violence or drug trafficking crime (including a crime of violence or drug trafficking crime that provides for an enhanced punishment if committed by the use of a deadly or dangerous weapon or device) for which the person may be prosecuted in a court of the United States, uses or carries armor piercing ammunition, or who, in furtherance of any such crime, possesses armor piercing ammunition, shall, in addition to the punishment provided for such crime of violence or drug trafficking crime or conviction under this section— (A) be sentenced to a term of imprisonment of not less than 15 years; and (B) if death results from the use of such ammunition— (i) if the killing is murder (as defined in section 1111), be punished by death or sentenced to a term of imprisonment for any term of years or for life; and (ii) if the killing is manslaughter (as defined in section 1112), be punished as provided in section 1112. Okay, that might be more of a challenge than it seemed at first. [A]ny person who, during and in relation to any crime of violence or drug trafficking crime … uses or carries a firearm, or who, in furtherance of any such crime, possesses a firearm, shall, in addition to the punishment provided for such crime …. [be sentenced to more time]. So, a defendant who had a firearm is punished more severely than one who didn't. How much more depends on the firearm and what he or she did with it. If it applies in a particular case it means at least five extra years, up to and including a life sentence. So it would seem kind of important that Congress write such a law in a way that people (like federal judges) can understand it. But it didn't. That bramble of prepositional phrases may excite the grammar teacher but it’s certainly kept the federal courts busy. What does it mean to “use” a gun “during and in relation to” a drug trafficking offense?… What does and doesn't qualify as a "crime of violence"? [F]ive decades after the statute’s enactment and courts are still struggling to say…. And then there’s the question posed by this case: What is the statute’s proper unit of prosecution? The parties before us agree that Philbert Rentz “used” a gun only once but did so “during and in relation to” two separate “crimes of violence”—by firing a single shot that hit and injured one victim but then managed to strike and kill another…. [D]oes the statute permit the government to charge one violation or two? Probably most of us would agree that Rentz did manage to commit two crimes with just one shot. But did he "use" it "during and in relation to" both crimes or only one? And more to the point, what did Congress intend this thing to mean? There's no point in my analyzing it again—if you're interested in seeing how this works in practice, the opinion is a really well-written example of that. To cut to the chase, the majority (of course there are three separate opinions) held that while the government can charge Rentz with two crimes, to apply the sentence enhancement it has to prove two different "uses." So now you know. Maybe Congress should have to diagram these things before they pass them in the first place?